As much as winter is the time for soups and stews, I really like summer soups too. 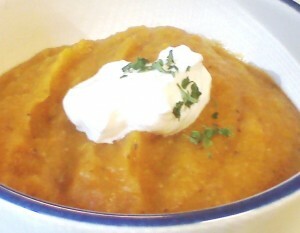 This one isn’t too hearty since it’s a puree and I think it tastes really light when it is served warm, not hot. I’ve had to become really creative with vegetables this summer— with so much amazing local produce, I tend to over buy! I like to base this recipe on carrots, because the orange color of the puree is so inviting, but feel free to experiment with whatever is in your basket. Just remember to include a starch (potato, sweet potato, kohlrabi, etc.) to help thicken the dish and something sweet (apple, beet, melon, peach) to make this unique for summer. Herbs are totally up to your discretion, too. I like fresh basil, but if you have rosemary or thyme or some oregano, those would be great as well. Whatever you do, you are making a crock pot of wonderful by using fresh vegetables and your imagination. This should be served in a bowl, but it’s perfect when it’s thicker than soup, but thinner than mashed potatoes. PS– it’s also a GREAT puree for baby food, but you can make it for your whole family to eat. Enjoy! Put all vegetables and herbs into the crock pot, pour broth on top. Cook on high for 6 hours. Using immulsion blender, puree in pot. (If you don’t have one, then let dish cool and puree in batches in a standard blender.) Serve with a dollop of sour cream or greek yogurt on top and a sprinkle of fresh herbs.